The move comes just a few months after the shuttering of the restaurant’s short-lived Williamsburg outpost. 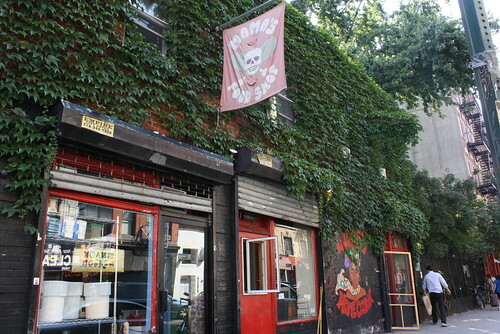 At that time, Mr. Clancy, who took over for longtime owner Michael Rosenfeld in 2007, said he was open to finding an investor for the East Village location. In 1999, The Times’ “$25 and Under” critic Eric Asimov, in a $10-and-under roundup, wrote that “this little self-serve restaurant with just a few tables, offers homey American dishes that are the equivalent of white picket fences and shady elm trees.” The menu and the business model – which called for customers to order a meat and a side (or three) at the front counter – never changed much, and the place never did score a liquor license. Brunch was eventually added and the restaurant got a boost from an appearance on Guy Fieri’s “Diners, Drive-ins and Dives,” but it apparently wasn’t enough. Here’s Mr. Clancy explaining his decision to call it quits. Due to increasing rents and property taxes, and the constant expenses that arise when maintaining an older building, it has become no longer possible to keep our doors open. I have no distain for the landlords in the East Village, for they are put in a precarious position of having an overhead that they too cannot afford. Sadly, it is the small businesses that suffer from the escalation of the above market commercial rents and property taxes. I now join the ranks of Kate’s Joint, Zaitzeff, Life Café, and Lakeside Lounge; all business that have folded in a neighborhood going through a period of flux. I look forward to seeing what the East Village becomes (Avenues A-C especially), for at this moment it is a neighborhood that is in the midst of change. Avenue B is a ghost town commercially, the community nature of the neighborhood has all but vanished, and it is over-run every weekend by a generation that has no vested interest in the East Village community except to visit on the weekends. By no means is this an indictment to the new, younger generation, it is more of an admission that much of the steady business for bars and restaurants has moved to Brooklyn and the high residential rents have stripped the neighborhood of the artistic/cultured feel it used to be known for. Mama’s Food Shop has weathered these changes, including surviving the recession, but as these changes started affecting our business, I realized it was the end of an era. I am a restaurateur and artist who has lived in and loved New York City for almost twenty years. Luckily, the city and its neighborhoods will always be going through change and I am excited for what is to come both in the East Village and beyond. I will move on, get a full time job, and continue to support the underdog small businesses in and around the city. I simply can’t run one anymore- it’s just too damn hard.